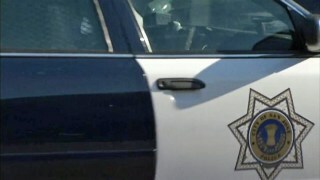 File image of a San Jose Police Department patrol car. A motorcyclist was killed Sunday afternoon after a collision with another vehicle in South San Jose, according to police. At about 3:50 p.m., officers responded to a traffic collision at Blossom Hill Road and Judith Avenue, police said. A 23-year-old man was traveling eastbound on Blossom Hill on a 2003 Suzuki GSXR motorcycle when he collided into the back of a black 2007 Ford Edge that was stopped for traffic. The motorcyclist, who was not wearing a helmet, was pronounced dead at the scene, police said. The driver of the Ford Edge remained at the scene and cooperated with the investigation. It was the 14th fatal collision and 15th death involving a collision in San Jose this year, police said. Anyone with information about the crash should contact Detective Kevin McMillin of the San Jose Police Department's Traffic Investigations Unit at 408-277-4654.